The speaker decries the ugly and divisive politics of his party, yet he promises to back the ugliest and most divisive nominee. Paul Ryan wants very much to be recognized as the adult at the kids’ table that his Republican Party has become. And much of the media will afford him that recognition, as no one in the party works harder to curry the favor of the print and broadcast outlets that long ago formed an amen corner for the House speaker. Ryan endeavors to portray himself as a diligent public servant who simply wants to do the heavy lifting required to reform government and the economy. (Even if he is a tad vague about his precise mission: shaping budgets and rewriting tax codes to favor the interests of the billionaires, bankers and corporate CEOs who donate so generously to the many campaign funds he manages.) But, when push comes to shove, Ryan invariably succumbs to the tantalizing offers of a vice presidential nomination, a more powerful committee chairmanship or a speakership. And no one should be so naive as to doubt for a second that Ryan would—after his usual protestations to the contrary—accept the 2016 Republican presidential nomination if it was offered up on the silver platter he always demands. That does not mean that Ryan expects to get the offer. He is savvy enough to know that his party is likely to settle on a nominee before the convention in Cleveland that he will chair; and that the pick is likely to be one of the candidates who actually campaigned for the nomination. But Ryan is also aware of the practical concern among thinking Republicans about the political dangers of nominating an extremist—probably Donald Trump, possibly Ted Cruz—who will unsettle the great majority of Americans and potentially doom the party to devastating defeat. Despite his protests to the contrary, Ryan wants to be seen as “presidential” — as the party’s once and future hope. So Ryan is grabbing a bit of the spotlight to signal that he is always available. And that, should all hell break loose at the convention or next November on Election Day, Republicans would be wise to continue to embrace him as their party’s once and future hope. When Ryan calls his party to the higher ground, as he did Wednesday in a particularly self-serving address about the state of American politics, it must be understood that he sees himself at the pinnacle. And he is not about to do anything to alter that image. He will take no risks. He will never, ever act of principle. He will simply peddle platitudes designed to earn himself good reviews—and to strengthen his position as his party’s essential man. “I have made it a mission of my speakership to raise our gaze and aim for a brighter horizon,” Paul Ryan declared Wednesday, in a Capitol Hill address that fretted about everyone else’s rhetoric but that found much to celebrate in the service of… Paul Ryan. “Instead of talking about what politics is today, I want to talk about what politics can be. 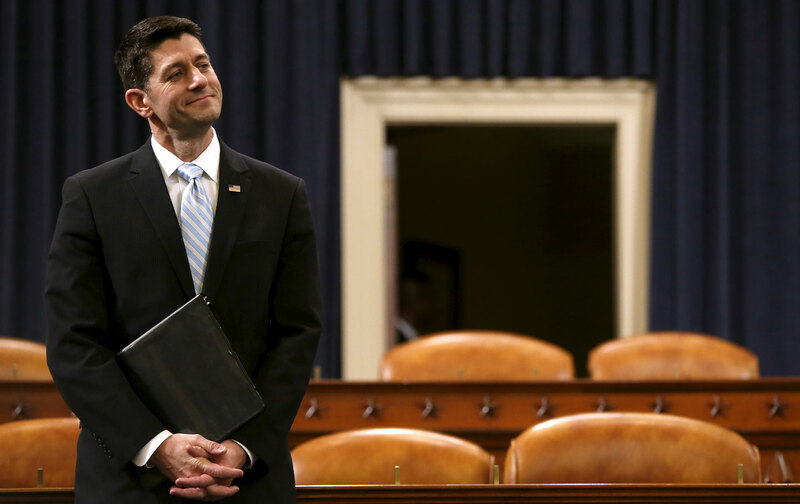 I want to talk about what our country can be,” said Ryan. Is there anyone who seriously believes that the Democratic competition between Hillary Clinton and Bernie Sanders is stirring up an equal level of disenchantment (not to mention fear, loathing, and Google searches about relocation to Justin Trudeau’s Canada) as a Republican contest in which Trump and Cruz are exchanging threats about the revealing photos and Goldman Sachs schemes of their respective wives? But there are Republicans who comfort themselves with the notion that it is not just their party that has gone off the rails. Ryan counts on this naïveté. What else could explain his confidence that grassroots Republicans (and Americans of a more independent or Democratic bent) might still look to a hyper-partisan member of the Republican establishment, who has always erred on the side of bank bailouts, corporate-friendly trade deals, and redistribution of the wealth upward, for insights regarding the anti-establishment tenor of the 2016 race? If anything, Ryan’s address on Wednesday was a bit more pointless than the attempt by his former running mate, Mitt Romney, to prevent Republican front-runner Donald Trump from remaking the Party of Lincoln as the Party of Trump. Romney’s convoluted speech at least named the enemy of mainstream Republicanism and American stability (Trump) and suggested alternatives. Ryan did not even go that far. As usual, Ryan made a statement that was intended to be heard by elites as criticism of Trump—“We shouldn’t accept ugliness as the norm.… Politics can be a battle of ideas, not insults”—but that avoided the sort of direct and uncompromising language that might anger the billionaire. Ryan did not even mention Trump by name. Yet, no one has done more to enable Trump than Ryan. Every time the speaker mildly “criticizes” Trump’s vile pronouncements and proposals, Ryan acknowledges that he will, of course, back Trump as the party’s November nominee. Ryan has claimed that he cannot make a meaningful statement about Trump or Trumpism, Cruz or Cruzism, because he chairs a Republican National Committee trust that is busily raising money to help the eventual nominee outspend the Democrats. In other words, Ryan thinks fundraising for purposes of partisan positioning is more important than taking a stand for the future of his party and his country. Other Republicans have been far more principled in their approaches. Members of the House and Senate have said they would not vote for Trump as the party’s nominee. Former candidates have endorsed rivals, in hopes of preventing a Trump nomination. Principled leaders have taken tough stands. But not Paul Ryan. He’s just telling Republicans to “raise our gaze and aim for a brighter horizon”—where, surprise, Paul Ryan happens to be standing.